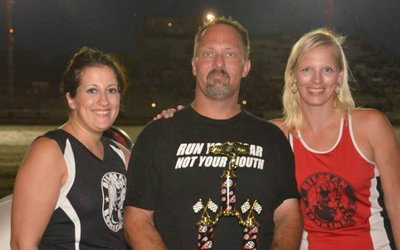 Winner’s photos are courtesy of Betty Nordstrom of NoDak Speedway. 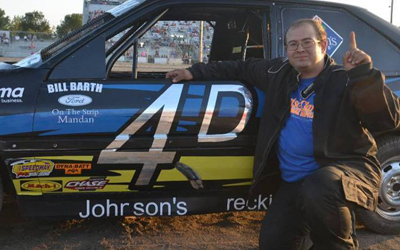 It was Hedahl's Auto Parts night at the Dacotah Speedway, Friday August 8th. 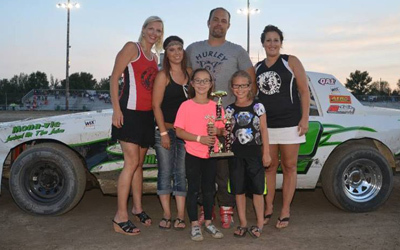 Over a hundred drivers traveled to the Dacotah Speedway on a regular night of racing that included the IMCA Sport Compact Mach 1 cars, IMCA Modifieds, Hobby Stocks, WISSOTA Street Stocks and INEX Legends. Only the top four from the 12 lap IMCA Modified concy would transfer to the feature. Joren Boyce blew by pole sitter Chris Welk to take the lead on the start. Welk fell into the clutches of Josh Wolla and Herb Bargmann. The three drivers battled hard for second place. Hugging the guardrail, Wolla slipped by Bargmann and Welk to take the second position. Welk rallied back and raced side by side with Wolla before Wolla cleared Welk a final time and pulled away. Boyce led all 12 laps to win the concy. Wolla finished a distant second ahead of Welk and Bargmann. Rookie Brandon Anderson grabbed the lead from pole sitter Nic West at the start of the 10 lap IMCA Sport Compact feature. West quickly fell off the pace, taking his car to the pits. As Anderson started to distance himself from the field, Kody Stoxen and points leader Josh Roehich battled for second. They raced side by side for several laps before Roehrich took the position on lap five. As Roehrich started to reel in leader Anderson, Chance Seelye was all over Jamie Schlafmann's rear bumper for fourth. Schlafmann's car bobbled out of turn four which gave Seelye the opportunity to dive low under Schlafmann and take the fourth position with one lap to go. Seelye held off Schlafmann to finish fourth. Kody Stoxen finished third while Josh Roehrich made a last lap pass to win his third feature victory over Brandon Anderson. Napoleon's Jesse Foster quickly took the lead from pole sitter Ben Meuchel in the Hobby Stock feature. Meuchel faded through the field, losing second to Trenten Jangula and briefly raced three wide for third with Dylan Thomas and Jeremy Engelhardt. Engelhardt shuffled by Thomas and Meuchel and challenged Jangula for second. Engelhardt muscled by Jangula and took the lead from Foster on lap six. Foster's car started to get loose, losing positions quickly through the field. With five laps to go, Foster lost a left rear tire and spun, collecting Blake Prado and Roy Erickson. On the restart, Engelhardt pulled away while Thomas, Brent Vetter and Jaren Wald raced three wide for second. Contact between Vetter and Thomas dropped Thomas back to forth as Vetter tried to hold off Wald for second. 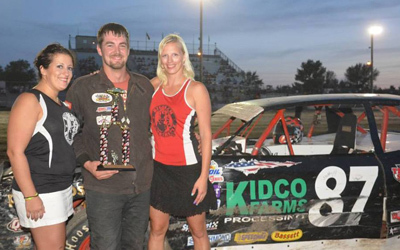 Jeremy Engelhardt cruised to victory, collecting his fourth feature win of the season. Jaren Wald made a last lap pass to take second place from points leader Brent Vetter while Dylan Thomas held off Trenten Jangula for fourth. Jeremy Schmidt and Scott Olson raced side by side for the lead in the WISSOTA Street Stoc k feature. Olson took the lead from pole sitter Schmidt as Schmidt tried to hold off Matt Brendel for second. Brendel would power by Schmidt and challenge Olson for the lead. They would have company up front as Cole Lewis made it a three car battle for the lead. Brendel shuffled to the lead but Olson rallied back to retake the lead. They continued to battle side by side until a caution on lap eight regrouped the field. Brendel pulled away from Olson on the restart but would run into trouble with seven laps to go when a mechanical problem would send him to the pits early. Bismarck's Eric Harpole would inherit the lead after the caution. Harpole bobbled on the restart, allowing Travis Ulmer of Mandan to burst into the lead with five laps to go. Harpole rallied back and they raced side by side for the lead with four laps remaining. With two laps to go, Harpole cleared Ulmer for the lead and went on to win his first feature victory at the Dacotah Speedway. Scott Olson finished third ahead of David Falkenstein. Shawn Volk, who started last in the 27 car field, rounded out the top five. Pole sitter Jon Schumann led early in the INEX Legends feature. Schumann's lead was short lived as Minot's Shane Williams blew by on lap two after starting ninth. After a lap three caution, Williams and points leader Donavin Wiest battled for the lead on the restart. Young Troy Hoff made it a three car race for the lead before yet another caution slowed the pace. Wiest and Hoff raced hard for second on the restart. Wiest reclaimed the second position and as the laps wound down, started to close in on leader Williams. Using the low line around the track, Wiest looked low under Williams and they raced side by side coming to the white flag. Williams just narrowly edged Wiest at the line when a caution on the final lap ended the race. Since the leaders took the white flag, the race was declared official. 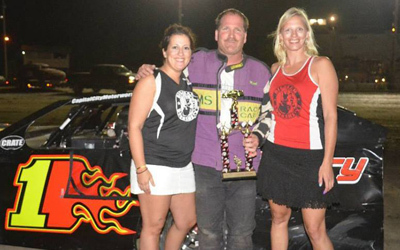 Shane Williams won his second feature of the year over points leader Donavin Wiest. Troy Hoff held off Brian Schirado and Paul Morman for third. In the final feature of the night, Brian Swenson grabbed the lead from pole sitter Mike Nelson in the IMCA Modified feature. Swenson got loose, allowing second place Tracy Domagala to steal the lead away. Swenson faded through the field, losing positions to Shawn Strand, Mark Dahl, Marlyn Seidler and Spencer Wilson. Strand and Dahl raced side by side for second before Dahl blew by on the high side on lap five and into the lead on lap six. A caution on lap 10 regrouped the field and on the restart, Domagala and Strand raced hard for second and raced side by side for many laps. Strand finally cleared Domagala for second on a restart with 11 laps to go and powered into the lead. Dahl rallied back, racing side by side with Strand for the win. Dahl's high line around Dacotah Speedway gave Dahl the momentum to retake the lead with four laps to go and hold off Strand for his first feature victory of the year. Tracy Domagala finished third while Jeremy Keller crossed the Open Road Honda finish line fourth ahead of Marlyn Seidler. On the card for Friday, August 15th is the Amsoil-Wissota Street Stock Qualifier race, plus IMCA Modifieds, INEX Legends, Dacotah Speedway Hobby Stocks and IMCA Mach 1 Sport Compacts, brought to you by The Trailer Store of Mandan.